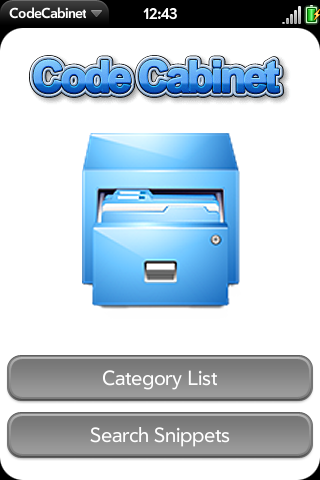 Code Cabinet is a free application from the book "Practical webOS Projects with the Palm Pre". It allows programmers to store (in a device-based database) and categorize snippets of code. For each snippet, meta-data can be attached to it, such as the original author of the snippet, a link to a web site where it came from, notes about the snippet, keywords to associate with it, and more. The user can then look up snippets by browsing through them, or search for a snippet based on any of the meta-data, or the code itself, and a snippet can then be eMail to a specified address (so when your coworker asks you for that special sorting algorithm that he just *HAS* to have to finish a ask, and you happen to be getting ready to board a plane, you can go ahead and send it to him).